Premier of Nevis Hon. Joseph Parry celebrates Reginald “Reggie” Douglas moments after he crossed the finish line in the TriStar111Nevis triathlon on Saturday. He was the first local triathlete representing St. Kitts and Nevis to complete the race. NIA CHARLESTOWN NEVIS (April 06, 2011) — Premier of Nevis Hon. Joseph Parry could not contain his elation on Saturday, as he like hundreds of Nevisians, witnessed the island’s top triathlete Reginald “Reggie” Douglas as he crossed the finish line in 7th place. Douglas was the first local participant to complete the gruelling race as he competed against world’s class triathletes. 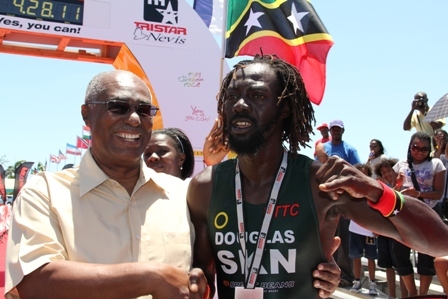 In brief spontaneous remarks, moments after Douglas who represented St. Kitts and Nevis crossed the finish line, just over four hours after the start of the 111TRISTAR Nevis event, Premier Parry congratulated him and urged him to continue to compete in the world class race. “Yes we are all proud today of our Nevisian Reggie Douglas for his [performance] among some of the best professionals in the world. Congratulations and keep working, one of these days you are going to come in number one right here on the island of Nevis,” he said. In response, Douglas thanked the Almighty for having given him the necessary endurance to complete the race. Earlier on in an invited comment, the Premier described the world class triathlon as a great event for Nevis and registered his satisfaction with the local support for the athletes. “I think it’s a great event for Nevis. First of all I must speak on behalf of Nevisians and say that we are very happy that this event is here today and we have to thank TRISTAR for that. “I am pleased to see that so many people have turned up this morning, not only here in Charlestown but all along the road round the island,” he said. Meantime, looking ahead Mr. Parry said Nevis was looking forward to the 2012 event since the 2011 race was the first of five in the coming years and hoped that the international event would continue to grow. “I hope that this event will continue to grow and next year it will be even bigger. Let me tell Nevisians it is a five year sponsorship so this is the first year of the five. We are looking forward to having great athletes next year and having great crowds from Nevis and St. Kitts next year,” he expressed. At the end of the event Mr. Chris McCormack from Australia won the TriStar111Nevis in 3hours and 34minutes, Olivier Marceau of Switzerland came second and Canadian Wolfgang Guembel placed third. For the women Great Britain’s Emma-Kate Lidbury won in 4hours and 07minutes before Brazil’s Fernanda Keller who placed second and Guadeloupe’s Guylyne Louis in third place.